This book was enthusiastically recommended by other PatternReview members in the feedback from the recent “Member in Focus” article on PR, which graciously featured me as the guest. I haven’t had a chance to read the book in depth. It’s soft-bound, and stapled down the spine like a thick magazine. 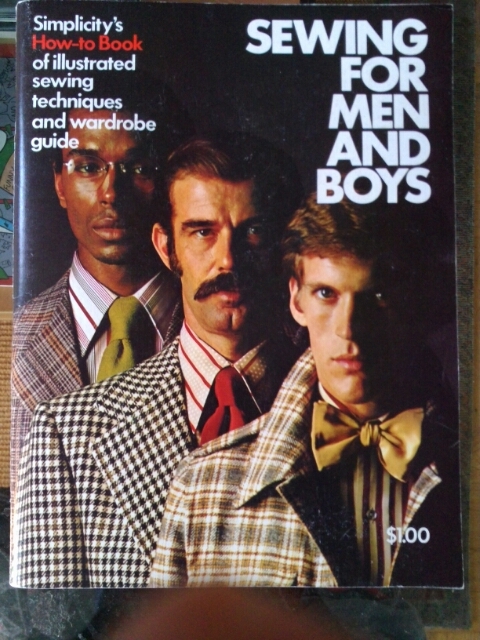 It seems like the bulk of the book covers sewing techniques specific to menswear – collars, cuffs, etc. There’s also some info on both traditional tailoring and speed-tailoring – producing a tailored jacket with fusible interfacing and machine stitching rather than padding and hand-stitching. The book also does have some info on fitting, but on very first glance I was sort of hoping for more. Finally, the book has some truly scary examples of ’70s fashion. Would it be too much to admit I’m sort of toying with the idea of doing a ’70s revival garment? I recently finished watching Craftsy’s class “Pant Construction Techniques” featuring Sandra Betzina. You can read my review at the PatternReview website. Suffice it to say I didn’t like Sandra Betzina as a teacher and don’t recommend the class. Since I feel freer to discuss this review on my own blog, I’ve noticed this review has generated a bit of controversy in the comments section. Some people agree with me that while Betzina certainly has the credentials to teach this class, her presentation isn’t as clear as it should be. Others loved the class and preferred her instruction to the pattern directions while making their pants. I’ve seen two other Craftsy classes with great instructors that communicated clearly, spoke complete sentences, stayed on topic and connected their thoughts to form a complete narrative of the topic being discussed. I’ve also watched other video instruction, such as Nancy Zieman’s TV show and David Coffin’s DVDs, which are up to the same standards. And so I expected the same from Betzina, especially given her reputation. The other Craftsy classes methodically worked their way through the project, each lesson building upon the last with a clear progression towards completion, as if they were actually putting together a project from scratch. Betzina’s presentation really was a demonstration of techniques, and I didn’t get that same sense of progression from fabric to finished result. Also, because I come from an engineering background, I strive for a sense of precision in my sewing. I know not everyone is that way, and Betzina outright says she’s not one of those OCD perfectionists. It’s great that she’s upfront about her sewing style, but that doesn’t make me any more comfortable to watch. Finally, I felt somewhat uncomfortable posting a negative review like the one I did. I considered editing it down, but ultimately left it the way I wrote it. Even though that review reflects my true feelings and assessment of the class, sometimes I feel forums like PR expect everyone to take a positive outlook on everything, even when criticism might be unpleasant but helpful. I feel a little bit like I’ve pointed at the dead elephant in the middle of the room by saying something negative about a highly regarded and well-respected name in the sewing community. I suppose in the end I’m happy to see it has sparked a discussion, and if people disagree with my review I really hope they will write a review of their own. I’d love to know more about what they see in the class and in Sandra Betzina. When my mother passed away in 2000, I inquired about the fate of her ’70s-era Singer Touch-and-Sew (it ended up going to one of my sisters). Hey, Mom’s sewing machine is basically kaput. Unfortunately it was in storage for a while before I got it and the extreme weather conditions basically rusted the entire chassis. Add the fact that there is no instruction book and 95% of the cams are gone and even the shop I took it to to get it restored wasn’t able to get it running. I still have it, can’t bring myself to toss it. It’s in my back bedroom with the stash that I have from my quilting. I use my Bernina now days but I am kinda all sewed out. Probably good that I got a new machine to get started with sewing, then! It’s nice to know it lives on then, even if only as a souvenir. Hopefully I’ll be able to post about new sewing projects soon. I’m glad to hear someone else who felt the same way I do. I haven’t taken her Craftsy class, but did take one at the ASG conference in Sacramento several years ago. The brochure promised you’d have a perfect fitting pair of pants by the time the day was over. NOT. She was totally disorganized, forgot half the materials and had to have her husband bring them up from San Francisco, a couple of hours into the class; spent much too much time with a few, and almost no time with many. She brought fitting muslins, and had everyone try them on so she could tell you what size you needed. Then after I used the size she told me, pin fit the pattern and got her approval, and cut my fabric, she decided I needed a differnt size than she’d initially thought. I found her teaching style to be a disorganized, confusing, mess. The only thing I came away from that class with was a pattern that didn’t fit my body, denim cut to the wrong size, and her voice in my head yammering about all the other things she had that you NEEDED to buy from her. Haven’t made that mistake again. Thanks for sharing your experience. It does reinforce my opinion of her teaching style. I chose not to put it in my review, because I didn’t want to get into Sandra Betzina bashing. But I feel Betzina did try a bit too hard to plug her other books, patterns and classes in the “Pants Construction” class. The plugs stopped after the first two or three class sessions, and I sort of expect the instructors to plug their own products. But to me it seemed a little blatant in this case. I would not like that kind of teaching style either. 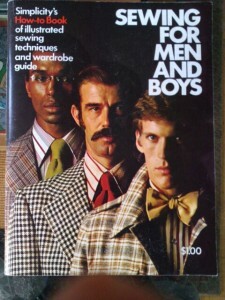 I’m curious whether you think the Sewing for Men and Boys book is worth buying. Have you checked out the beginner reading list a The Cutter and Tailor? I’ll definitely write a detailed review of Sewing for Men and Boys when I’ve finished with it. I have checked out the reading list at Cutter and Tailor. I am considering picking up the Stanley Hostek tailoring books at some point — sooner is probably better than later due to his advanced age — and the Roberta Cabrera tailoring book is also now readily available once again. I had put myself on a diet from buying new sewing books for a while. Overall, though, I didn’t feel welcome at all at the Cutter and Tailor forums. Their whole attitude was off-putting, and struck me as defeatist. They basically outright tell you in their FAQs that trying to teach yourself the art of tailoring is futile, and that the best you can do via self-instruction is to maybe get a job as an apprentice. I realize that some of this is their self-defense mechanism. The forum is assaulted by gratification-seekers who trivialize the art of tailoring by wanting quick results without putting in the time and effort to learn. But to me, their attitude is about as far from encouraging as you can get. Good to know you’ll post a review. We got the Cabrera, which looks good, although it doesn’t cover shirts and right now we’re focused on shirtmaking. David Page Coffin’s book is our main shirtmaking resource. As for The Cutter & Tailor, the way we look at it is that they are proud to be part of a craft steeped in tradition and with a long history. It can’t be easy to watch it shrink and to see what people with money are buying as alternatives to bespoke tailoring. The forum is primarily for aspiring and experienced tailors, so it makes sense that helping those people is their main objective. We’re just happy it’s possible to join the forum and benefit from information provided for beginners and for people who are connected to the garment industry but are not and never will be tailors. I haven’t tried watching Craftsy tutorials before. I did watch one of Sandra’s DVDs, “Jeans Couture.” I actually liked her personality. It seemed like she was having fun. Maybe she was just not in her best form in the one you watched. For just instructional purposes, where they go through each step of assembling the jeans, I found the DVD “Jeans for Real People” the best. It goes through every step in detail and has two DVDs. The first rule of Craftsy is to never pay full price. Instead, sign up for one of their free classes (they have a good one on basic sewing machine care and usage, and there’s another decent free class on zippers). Then, wait for them to start sending you sale notices and buy the classes you like on sale.